Master in Law & Finance. ESTUDIO DE BRACAMONTE, HAAKER & CASTELLARES ABOGADOS, Partner. ESTUDIO DE BRACAMONTE ABOGADOS, Partner. 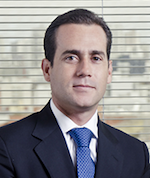 LAZO, DE ROMAÑA & GAGLIUFFI ABOGADOS, Partner. ESTUDIO ECHEANDÍA & ASOCIADOS, Associate. ESTUDIO ECHEANDÍA CHIAPPE ABOGADOS, Associate.